Lyric 3015 the Best Basic Controller Value! For small shops with basic controller requirements, the Lyric 3015 is the best value and the smallest footprint controller on the market today! Lowest price per port of any controller on the market. All SNA emulations included 5294/5394/5494. Easy to configure from any twinax terminal. Menu-driven, offline configuration. Automatic detection of attached twinax devices. No need to separately configure each port. Easy installation and use.Hardware, software, cable and documentation included in one box. Fully plug compatibleand interchangeable with IBM 5294, 5394 and 5494 Remote Control Units. 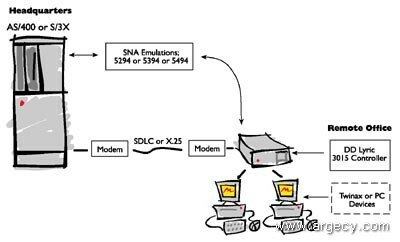 Connect to S/3X, AS/36 or AS/400 via SDLC or X.25. Lyric 3015 music to your network. Lyric 3015 has powerful, easy-to-use configuration tools. Controller customization is easy, using standard 3.5 diskette drive to store device, keyboard, and communication configuration parameters. Convenient, online, menu-driven controller configuration makes installation fast and smooth. As an option, a Windows-based offline configuration utility enables the system diskette to be configured without being connected to the control unit. Software upgrades are easy; with no downtime for reconfiguration. Remote file transfer using PC Support, Client Access and IBM emulation enables access to applications without additional software costs. Lyric 3015 is fully compatible with SDLC, X.25, IBM 5294/5394/5494 protocols. One host attachment is provided for access to an AS/400, AS/36 or System 36/38 support up to 56 Kbps with a RS-232 interface and up to 64 Kbps using V.35 or X.21 interfaces. It is also compatible with a variety of IBM programs, including OfficeVision/400, DisplayWrite/36, and Text Management/38. Lyric 3015 supports up to 16 twinax (5250-compatible) devices. Each port connects to seven addressable units using twinax or twisted pair cabling. Lyric 3015 supports up to 8 devices when attached to a System 36/38 or 16 devices when attached to an AS/400. Connection to System 36/38 is via 5294 emulation. AS/400 connection is via 5394 or 5494 emulation. Decision Data is ISO certified and widely recognized for its high-quality, cost-effective midrange solutions. In fact, we've won an unequaled 26 Buyers Choice Awards since 1990. With Decision Data, you will get the added benefit of 25 years midrange systems experience. You chose a great computer. Now choose the right remote controller. Only from Decision Data. Host Software: Supports IBM emulation, ClientServer/400, PC support/400 and S/3x, OfficeVision/400, DisplayWrite/36, Text Management/38 and others Operating Features: Easy configuration from a terminal, 132 column display, copy to print, IPDS, typehead, light pen and magnetic strip readers. Service and Warranty:With its small footprint, Lyric 3015 is designed for space saving in remote office settings. It is a cost-effective, high performance device that provides flexible and compatible remote connectivity solutions for System 36/38, AS/36 and AS/400 environments. Lyric 3015 comes with a one-year on-site warranty and a 90-day, money-back guarantee.